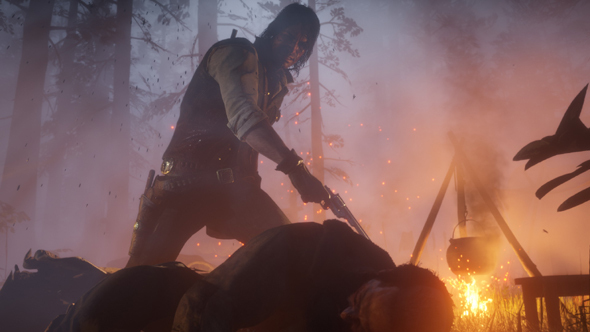 Update, May 4: Rockstar have released new Red Dead Redemption 2 screenshots to go with the new trailer. You can see them all below along with our analysis. Here’s everything we know about Red Dead Redemption 2 so far. 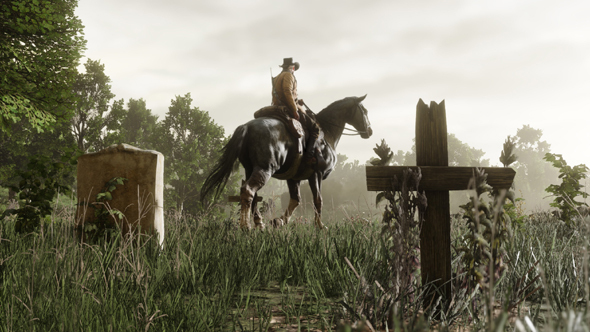 Protagonist Arthur Morgan riding past a couple of graves. This shot’s notable for the subtle fog effects, vegetation, and the sheen on that horse. What a shame the game’s not yet confirmed for PC, it could look better even than this. 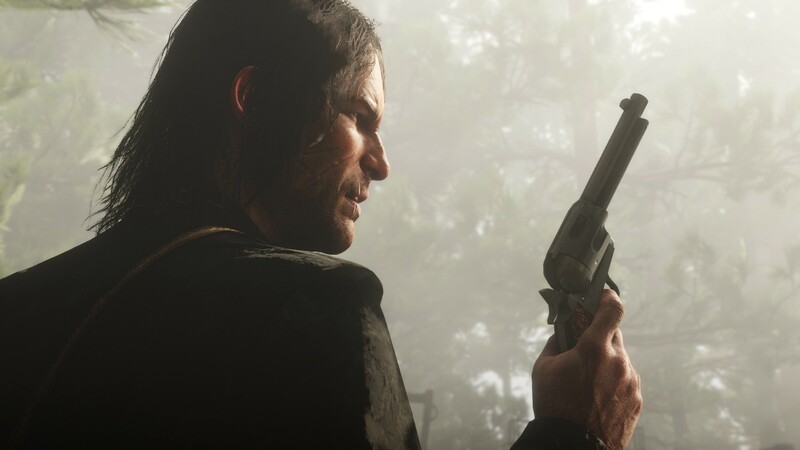 The excellent fog and smoke effects here almost distract us from the appearance of the first Red Dead Redemption’s main character John Marston, holding a gun at what appears to be fellow gang member Bill Williamson. 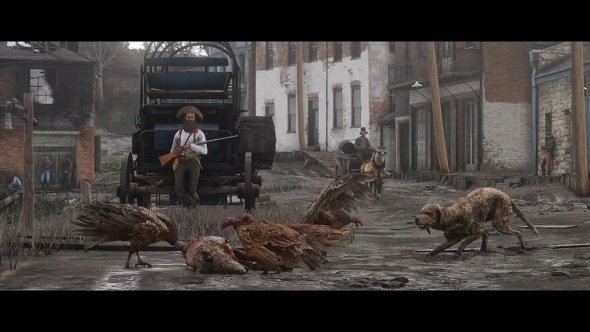 Going by what we know from the previous game, John has a falling out with the Van der Linde gang at some point – could this be the aftermath? 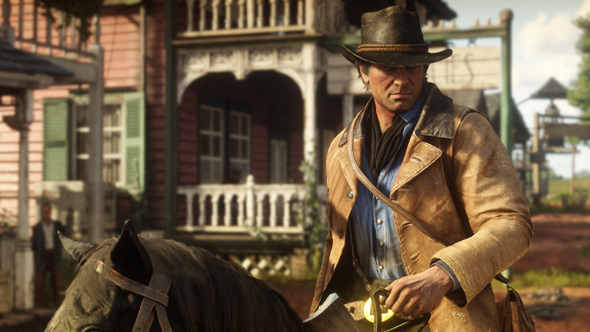 Arthur Morgan riding through town, which could be following the previous picture of him by the graves since he’s wearing the same outfit and riding a similar horse. Morgan, in different clothes this time. This is either part of a cutscene or players will get to pluck ducks in the game. Knowing Rockstar, it would not surprise us if we could. 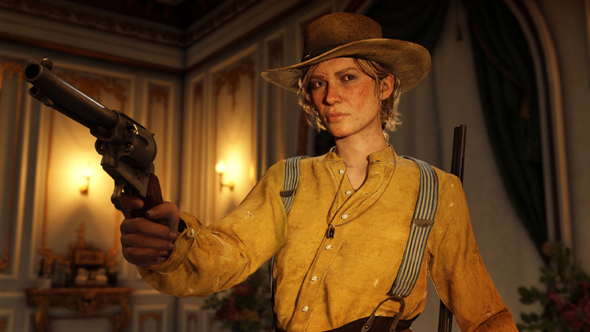 Sadie Adler, the only female member of Dutch’s gang. She’s in a number of these screenshots. That’s Sadie again on the left, but we’re not entirely sure who this man is. He’s dressed like John Marston in the first game, but the face doesn’t look quite right. 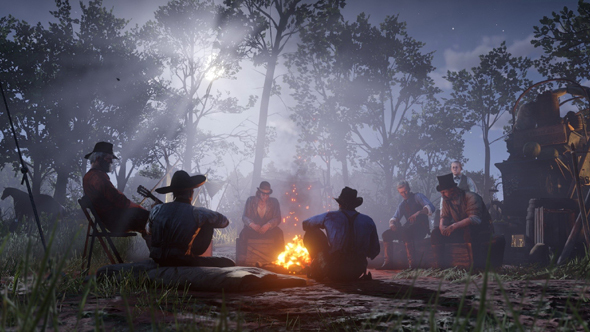 The Van der Linde gang enjoy a nice night by the campfire. That’s Arthur with his back to us. Once again, note the lovely effects. 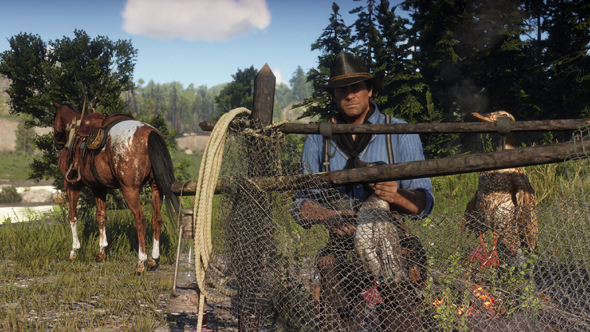 Dutch’s gang. 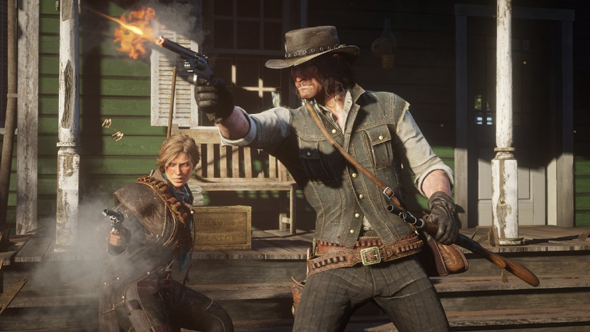 That’s Dutch van der Linde himself on the left, Arthur in the middle, and Sadie on the right. 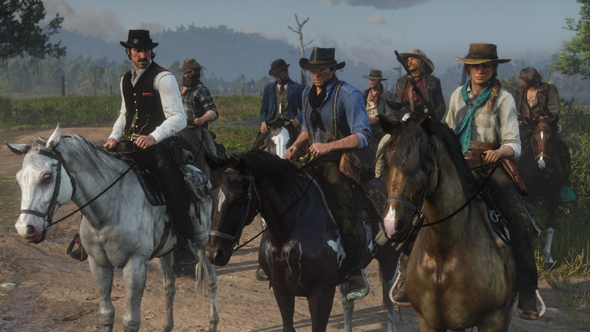 Other than Bill Williamson just behind Dutch we’re not sure who the rest are yet, but John Marston isn’t among them. This may be after he’s left the gang. We may be in for a long wait for Red Dead Redemption 2 on PC, but you can play the first one at least through Sony’s Playstation Now service. Original story, October 20, 2016:The Red Dead Redemption 2 trailer landed earlier today, and surprised many by being only 60 seconds long. 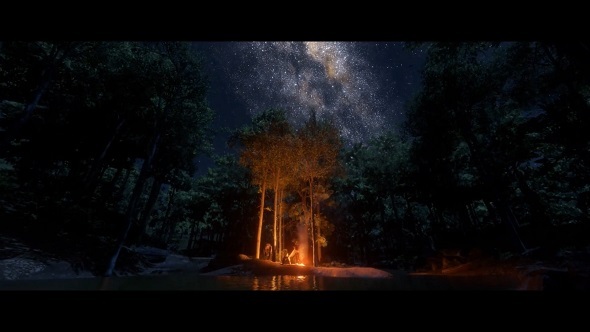 Butit was a pretty good60 seconds; the trailer was a visual feast, opening with some luscious landscape shots that capture the scale of America’s geography like little else in gaming. The second half of the trailer, by probably deliberate contrast, focused on the manmade world, and not in a flattering way: we saw squalid towns and a ranch set on fire. It’s worth taking a closer look at a few of these scenes, for they may contain some hints about what we can expect in the finished game. At the very least, speculation is fun, right? 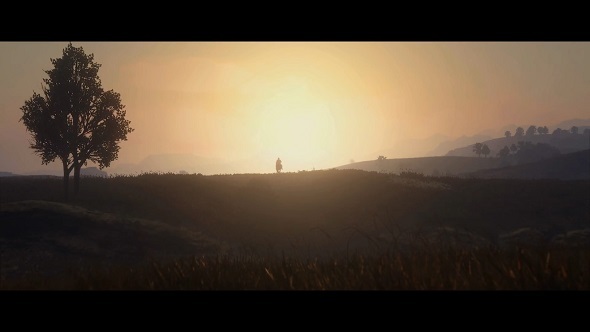 The trailer opens with a shot of an unknown rider cresting a hill as the sun rises. 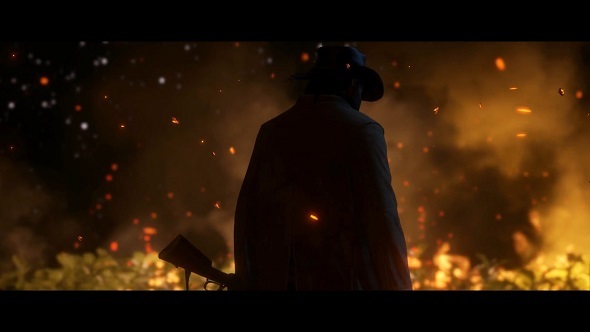 Could this be a returning John Marston? It looks possible, judging from the silhouette alone. There are some truly stunning shots of America’s landscapes on offer in the first half of the trailer. If the finished game looks anything like the below, we’re in for a treat. The actual business of cowboying – of rounding up cattle and managing a ranch – were big features of the first Red Dead Redemption, and rightly so, due to their role in taming the frontier. 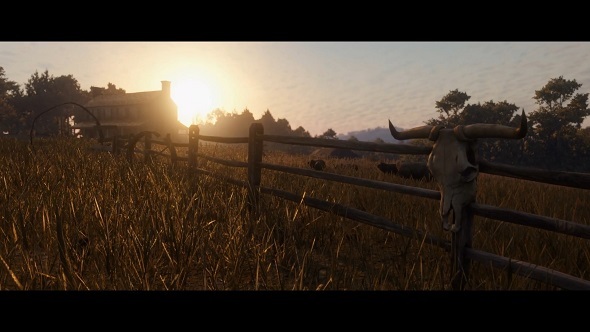 It has been rumoured that the new game might be a prequel, in which case it would make sense for ranching to make a return. A wanderer sets up camp under a chillingly clear night sky. A pair of travellers ride a canoe up a river. John Marston couldn’t swim in Red Dead Redemption and had to take an on-rails raft across a river to Mexico. Might this be set to change for the next game, with the addition of waterborne vehicles and/or swimming? 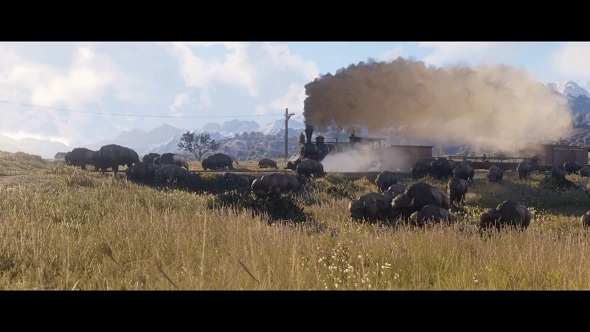 The locomotive here looks less modern than its equivalent in Red Dead Redemption, lending some credibility to the idea that the new game is a prequel. 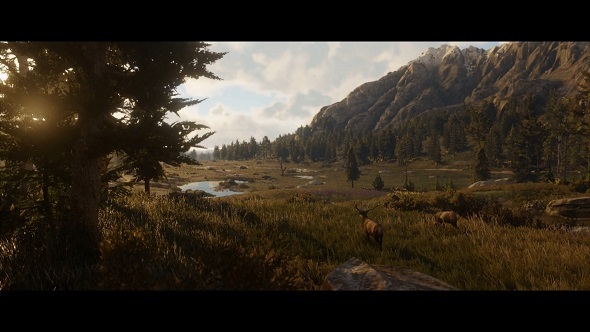 If the supposedly leaked map of Red Dead Redemption 2’s territory is genuine, the railway is less developed than in the original, and we might see it push into the frontier as part of the story. Note also the bison (they are not, technically,buffalo): you could get an achievement for killing every last one in Red Dead Redemption. It’s another gorgeous shot, but it depicts something ugly: the harsh side of life in the West, with stagecoaches, clothing and general squalour that stands in contrast to the grandeur of Blackwater in the original. A mysterious man surveys a burning ranch. 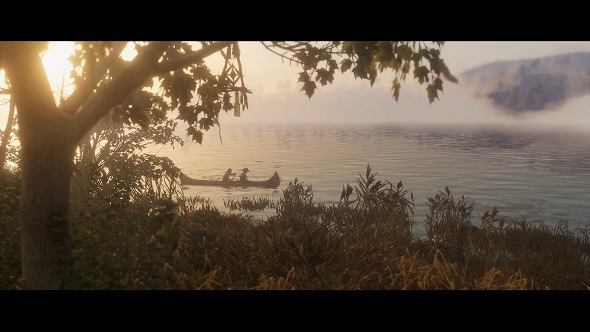 At this stage in the trailer, the narrator advises us to run. Might this be the antagonist? 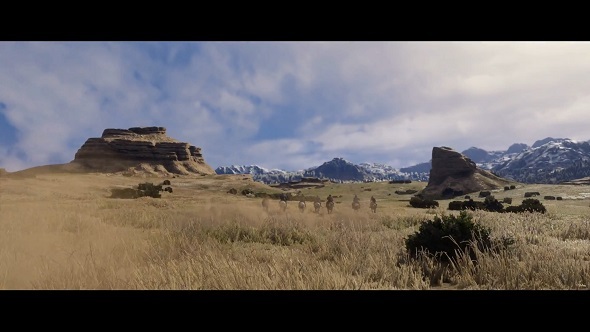 The trailer closes with this shot of seven riders – presumably the same seven as seen on the teaser art – riding into the plains. And with that, Rockstar dropped the mic. It was much more teaser-y than many expected, but did plenty to whet our appetite; if you’d like to browse these screens and one or two others in a better resolution, check our Imgur here. What do you think we can guess from them?